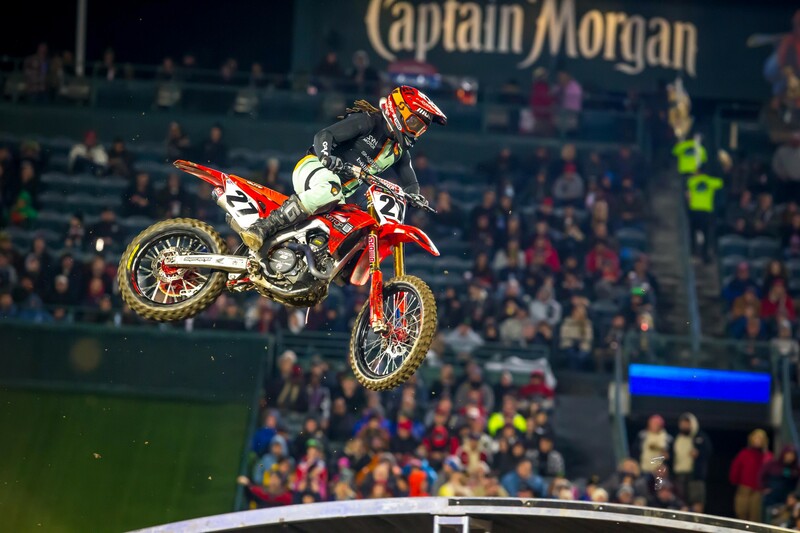 Comment: Jason Anderson broke his arm and rib while practicing before Oakland. He underwent surgery and is expected to miss at least eight weeks. Comment: Justin Barcia badly bruised his tailbone at Anaheim 2. It didn’t stop him from racing last week in Oakland. The team says he’s still sore but will race through it in San Diego. Comment: Bloss is working on being ready for the Lucas Oil AMA Pro Motocross Championship after tearing his ACL before the season. Comment: Chisholm sprained his wrist in the first turn at Anaheim 2. He wasn’t able to practice before Oakland but was able to tape it up and ride a few days this week. He’ll race through the pain in San Diego. Comment: LaMay crashed in practice last week and tweaked his leg. He plans on being ready for San Diego. Comment: Osborne is back on the bike after bending some hardware on his collarbone before the start of the season. He’s looking to return to racing in Minneapolis. Comment: Peick is on the mend after a terrible crash at the Paris Supercross resulted in major injuries and required multiple surgeries. To help with his recovery, check out the Road 2 Recovery. Comment: Raper broke his pelvis, a pair of vertebrae, and his nose in late November. There is no timetable on his return. Help him out via Road 2 Recovery. Do it. Comment: Tedder hopes to be back riding in February and racing in March after going multiple surgeries to fix nagging wrist issues. Comment: Stewart crashed exiting the whoops in Glendale and broke his femur. He underwent surgery and he’s out for the foreseeable future. Comment: Ames suffered a compound fracture to his left radius and ulna before the season. If that wasn’t bad enough, he developed compartment syndrome and an infection in his forearm. He’s not expected to race in the near future. Comment: Craig sustained a Bennet Fracture in his thumb before the season and is working on being ready for the start of the 250SX East Region next weekend in Minneapolis. Comment: Merriam is off the bike for a few weeks due to a back injury he was trying to race through. It was getting worse, which forced Merriam to take some time off. He’ll miss several weeks. Comment: Sexton is back riding after injuring his collarbone mountain bike riding before the season. He’ll be ready for the start of the 250SX East Region next weekend in Minneapolis.